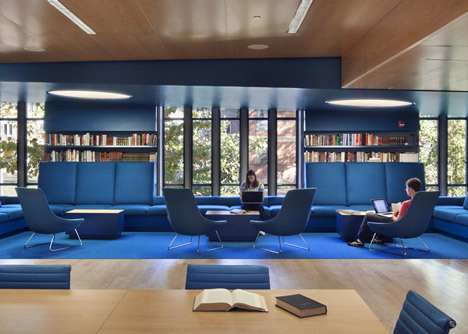 New York architect Joel Sanders has overhauled a library at Princeton University by installing interactive technology and colour-coded study areas (+ slideshow). The Julian Street Library is in a 1960's building on the campus and was originally a reading room with study spaces for solitary readers. The architects removed an existing brick wall and placed a ramp between the library and entrance area, creating a new space where students can relax and socialise. Maple panelling clads the floor, walls and ceiling on one side of the library to create a quiet study area with upright seating and communal tables. 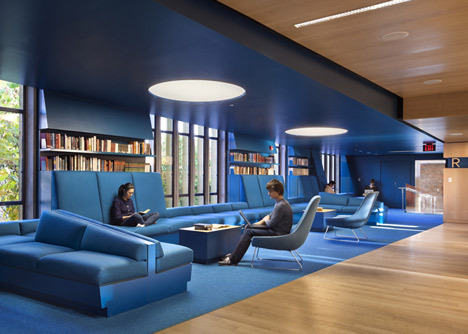 On the other side, the study lounge contains blue bookcases and banquettes for more relaxed working. There's also an interactive media table, displayed via a concealed projector, which allows students to exchange information and search the book collection. 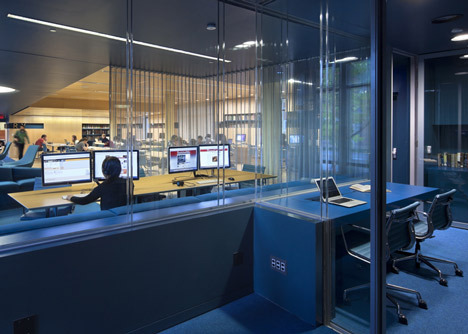 The project recently won an IIDA Library Interior Design Award. Photography is by Peter Aaron/OTTO. 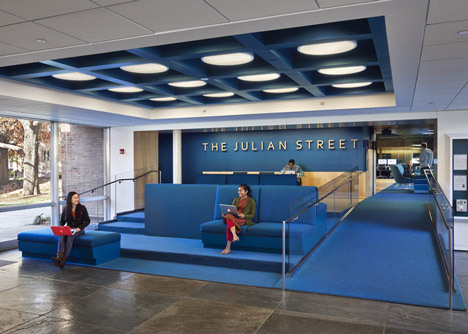 The Julian Street Library, a newly renovated library in a 1960s modernist building at Princeton University, transforms a 3,100 sq ft reading room into a state-of-the-art multimedia learning environment. Situated between a residential college and the main campus centre, the library acts as a hub for undergraduate students on their way to the central campus. Recognising that, with the advent of digital technologies, libraries are multipurpose spaces that sponsor study and social interaction, our design reconceives the refurbished library as a wired environment where students can work, lounge, and socialise day and night. Our solution solves the dual challenge of improving circulation between the vestibule and campus, as well as between the vestibule and library, by allowing the vestibule and library to overlap. We removed an existing demising brick wall, and taking inspiration from the Laurentian Library in Florence, brought the library into the vestibule by way of a dynamic ramp that pours into this previously underutilized space. No longer simply a threshold, the vestibule is now a space where students study, relax, and socialize. A series of terraced benches activate the vestibule and provide access to a communal library table and computer terminals located at the summit. The ramp then ushers students into the main library which is divided into two activity zones differentiated by color and materials. Traditionally conceived as single purpose spaces intended for studying only, libraries are now multi-purpose spaces that support studying and socialising. As a consequence, our project divides the library into two overlapping activity zones differentiated by color and materials. 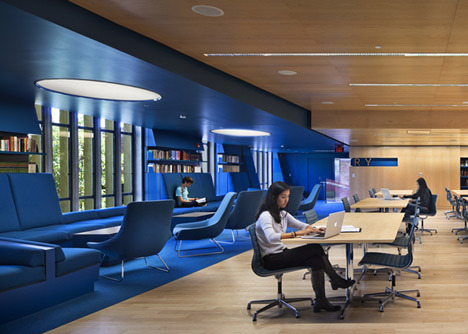 On the one hand, maple acoustical panelling clads the floor, walls and ceiling of the quiet study area where students work upright at communal tables and built-in computer stations. On the other hand, teal upholstered banquettes define the adjacent casual study lounge. Students can easily shift between both zones as their needs change throughout the day, allowing them to work either individually or collaboratively in a 24/7 wired environment. As students transition from reading a book to working on their laptop, study postures change, requiring different levels of focus, lengths of time, and degrees of engagement with other students. 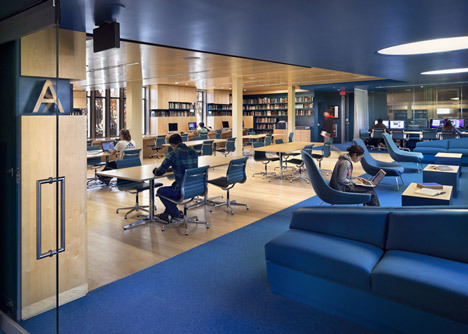 Our design provides various options – banquettes, tables and work stations – allowing individuals to transition easily from relaxed, passive postures (while reading or watching material for the first time) to more alert postures (while actively processing material and producing original work). Teal bookcases carved into the walls display the original Julian Street book collection donated to Princeton University in 1962. Built within these bookcases, birch-lined cabinets house computers and music recording equipment so that students have access to old and new media as they work. An electronic communal media table provides an interactive forum where students of Wilson College can exchange information with other students working in the vestibule and library, as well as remote locations on campus. 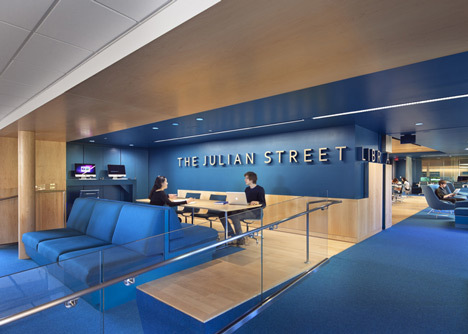 Concealed within the ceiling, a projector displays an interactive image on the table below where students may post events on a community billboard, search the original Julian Street book collection, and engage in social networking. Mobile furniture and sliding panels allow the space to be easily reconfigured so that it may accommodate various events – from studying to dining and partying.